Opening flag for factory in the U.S.A. The picture above is a simulated plan for the opening ceremony of the new factory that will make nursing supplies for the LIVEDO Corporation, which is starting to establish itself in the Western market. 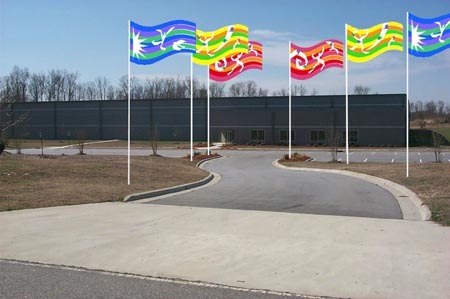 When it becomes a reality, I will be pleased if the flags appeal to the company and guests. However high it is, it's just a flag. A flag shows that a company has a certain approachable and freindly attitude. I think that the power of the message will lead to harmony with the local community.